As we delve deeper to the content gate debate, I inevitably keep thinking of my own complicated experience with gated content. Despite what’s probably an initial universal desire to flee, gating content remains one of the best lead generation tactics out there. I’ll be clicking around a site, deep in a post and I’ll catch a headline out of the corner of my eye, or a pop-up at the bottom of the page. More info, yes! Form, ugh! But more often than not, if I’m already getting good information, I give up the email address. I’m also more likely to give it up when I’m offered something other than an eBook or whitepaper; recently I’ve noticed more companies noticed gating content in more creative ways. Companies are offering services, assessments, parts of their product and privileged access. These are the types of enticing offers that can convince more reluctant readers to take the leap. Let’s check out a few prime examples. We thought X.ai was a really cool example of a company that, rather than offering reading material or information, is actually offering privileged access to a service in exchange for your email. X.ai is a personal assistant who schedules meetings for you. AI is all the rage right now and Amy, your AI buddy, can help you do tedious email back and forth that goes along with scheduling a meeting. You just cc her on a meeting request and she’ll handle it for you and notify you when it’s scheduled. Pretty cool right? They’re in the beta phase and all you have to do to sign up is hand over your email address and you have instant access. That seems like a fair trade to me. The difference is that they are offering easy access to tech, rather than an eBook or something of the like. It’s a service that makes your life easier. Another tactic that gets people to give over their info is to appeal to those who need something very specific and valuable – like designers who have to submit job proposals. For that very reason, Bidsketch provides killer proposal templates that can help take the headache out of the proposal creation process. Bidsketch’s template offer was well planned out, “People weren’t searching for ‘proposal software,’ but we did see (through an AdWords tool) that they were searching for templates,” explains Ruben Gamez, founder of Bidsketch. Signing up with them means that you get a awesome templates you need–and they get a lead on a top of the funnel client. Unroll.me is a service that helps you control all the junk in your inbox. When you sign up, you give them automatic access to your inbox. They troll through it and find all the subscriptions you’ve either deliberately or inadvertently signed up for and lay them out for you in a clear list that gives you the option to unsubscribe, Keep in Inbox or “Roll Up” into one single email that you receive each morning. That way you can scroll through 35 newsletters at a glance and pick the ones you feel like reading rather than deleting or archiving each one. It’s a great time-saver and a handy app that, for many people, is definitely worth passing along your contact info for. Who doesn’t want a little help cleaning out your mail and filtering out some of the garbage that you have to deal with every day? Lumosity is a cool site that is geared toward brain training – improving your cognitive functioning and memory. You get access to the games by signing up with your email. They provide tons of awesome games created by scientists and game designers that are fun and easy to play on your desktop or mobile. After you sign up you take a Fit Test to get your baseline scores on 3 games to see how you stack up against others in your age group. Then your training begins and you have access to over 50 cognitive games that are intended to improve human cognition. So far they’ve gotten over 70 million folks in 182 countries to sign up – and the best part is that each person playing their brain games is contributing to the overall data they are collecting on cognition and brain functioning. Death to the Stock Photo is pretty much exactly what it sounds like – a site devoted to reducing the amount of crappy stock photos on the web. You sign up with your email and get free photos by mail every month. We love getting our death to stock email every month, even if we don’t use the pictures because they’re on a theme that we’re not covering they’re always beautiful. Different photographers and artists sign up and showcase collections of REAL photos without any stocky cheesiness that you can download. It’s a great way to get inspired and also have some great pics on hand to supplement your next blog post. Offering a giveaway like this is tempting because it ensures that useful, practical and inspiring stuff shows up in your inbox every month. chieve higher goals. He’s got tons of posts that you can access on the blog but getting an ebook for your email seems like a great trade. There’s something even more exciting about getting a tangible reward for handing over your contact. And, the books are super handy with tons of useful advice, too. 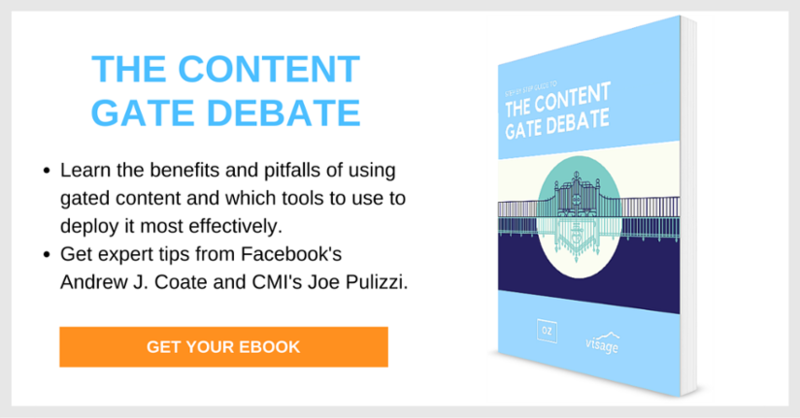 If you want to learn more about how gated content can generate leads and build your business, check out this comprehensive guide to gated content presented by Oz and Visage.